When you shop online, you never truly know if you're going to love what you bought. Will it be the same color in the photos? Is the size guide accurate? Will it look as good on me as it does on the model? All these questions run through your mind when you shop online, but wouldn't it be nice if you didn't have to worry about all these issues? That's what I love so much about Zappos. When I shop there, I know that they'll provide detailed information about the items that I buy. For instance, for these Joe's Jeans, I was able to utilize the actual Joe's Jeans size guide. So I got the right size I needed for these boyfriend fit jeans. Zappos also provides other details, including the fact that these jeans are 98% cotton, have contrast topstitching, and are machine washable. 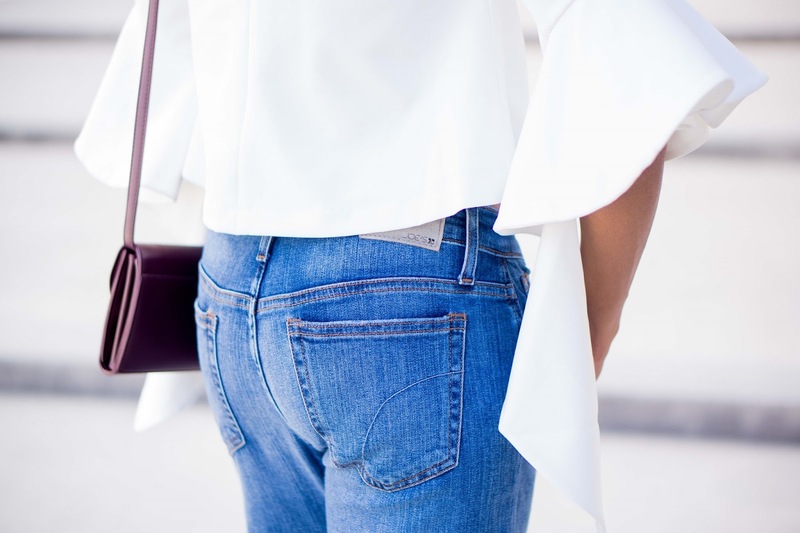 Knowing all that information made it easy to order these jeans, especially since Zappos also promises fast, free shipping, a 365 day return policy and 24/7, world class customer service. I've teamed up with my friends at Zappos for the perfect fall pairing between these jeans and these shoes. 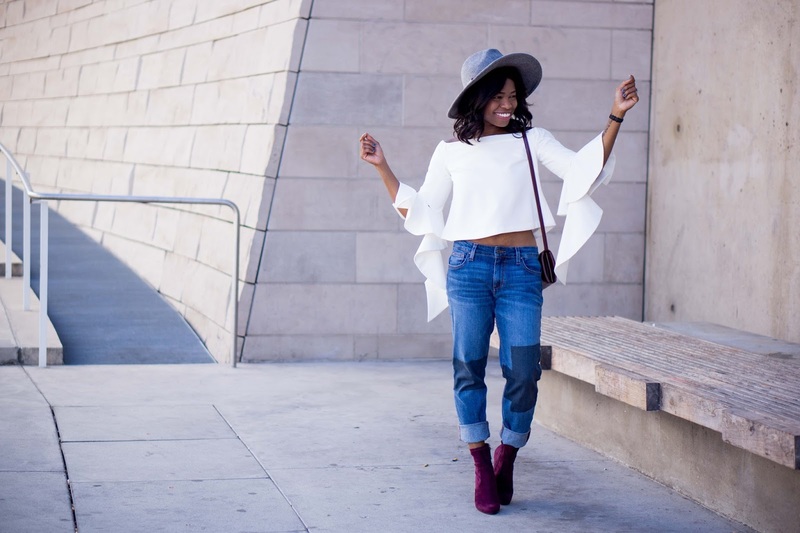 Two of my favorite trends this autumn are patchwork denim and wine colored booties. So I was happy to find the patchwork look in these Joe's Jeans, which come in a beautiful wash and premium silhouette. 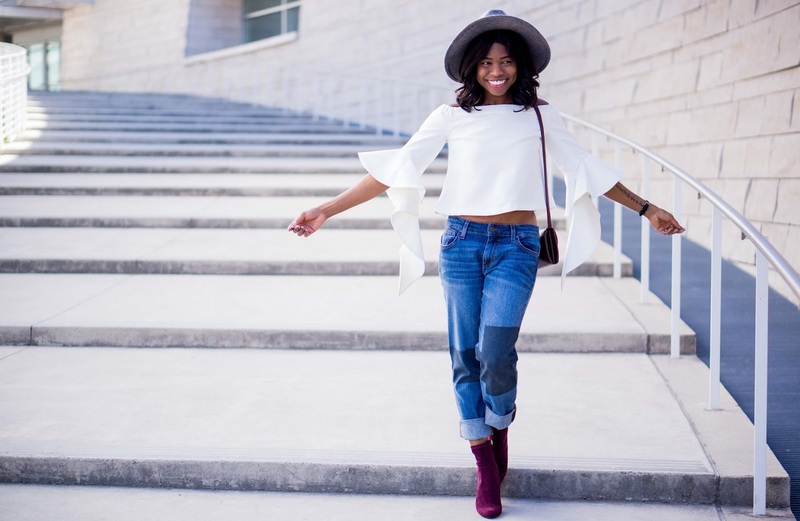 This Ex-Lover straight ankle in Jenni style really gave me the boyfriend fit that I was looking for this fall, and they make the details in this top really pop! And I couldn't think of a better pair of shoes to complete the look other than the Steve Madden Edit booties in burgundy. The bootie really creates a polished look with its wrapped block heel. These on-trend shoes are the perfect style staples for any occasion, any day of the week. And, they also come in black, taupe and a beautiful navy velvet! Velvet for autumn, anyone? I'm currently in Florida visiting some friends and my alma mater (first time since I graduated). Are you following along with my adventures on Snapchat and InstaStories (@ohtobeamuse)? But I'm still hosting the Monday Mingle Linkup so be sure to add your look below! And check out my linkup partners Take Time 4 Style and Momtrends to see what they're styling, too. These jeans look so good on you, loving this whole look. I loved this picture when I first spied it on Instagram. The sleeves are everything and provide a cool contrast with the jeans! I love it when websites actually have a good size guide! I hate when it is generalized since not every brand fits the same way! I love this look! Absolutely LOVE LOVE LOVE the boots. Love it, gorgeous! Love those purple boots too! amazing look! Love those booties! That is the perfect Fall pairing. I love the patchwork jeans and those amazing burgundy booties. Looking fabulous! Do come by and join your latest outfits with me Cheryl. Thanks, gorgeous! Such a cool outfit, Cheryl! I only have one Joe's jeans jeans, and it's one of my faves. Just great sizing. 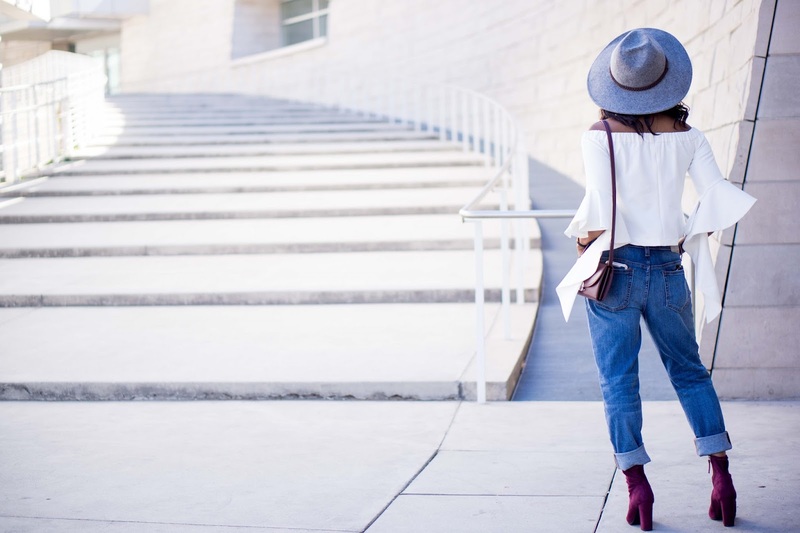 Love those booties and great tips on Zappos! Those booties are so bold and cute! Love the top,the sleeves are amazing! Everything about this outfit is just perfect! I love the sleeves and the detail of the denim. The boots are the perfect pop of colour! Great location for photos too. Thanks for sharing! Love that top, looks great on you. Ooh la la. . .you look Extra Fabulous and I love it all. I thought the top was going to be on the only star...but those boots! OMG! Girl, those boots are amazing! Those boots with those jeans look amazing! It's awesome when you can order clothes online and they fit you perfectly! I love your bell sleeve top! It looks like to moves so well. And your burgundy boots are quite on point! The boots and top are just right on C ! Great pairing. I love that top! Those sleeves! Those boots are very cool, and I love the colour! The top must be loads of fun to wear. Safe travels. The boots are so chic! Great pop of color.